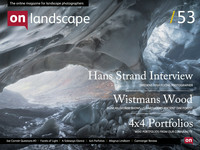 Tim: We’re here with On Landscape again, with some questions for Hans Strand. Hello Hans. First question from Paul Morton, who asks if you are getting any of your books back into print like Den Åttonde Dagen or the 8th day? Tim: Ok, a question from Liz Shepherd: Do you have a preference for intimate landscape or for grander views? Tim: So do you find it more of a challenge for the intimate landscape then? Tim: Is a lot of your photography pre-planned or is a lot of it synchronicity, making the most of what you have wherever you are? Tim: Was that the 5D Mark II? Tim: I was going to ask about colour, it’s something I’m interested in at the moment, so how do you compare the colour, have you shot side by side to see or what are your opinions from what you’ve done so far? Tim: Even at the very low ISOs? Tim: Do you use graduated filters on the D800 as well? Tim: And is the same, does the same theory go for the focus blending as well, do you focus blend? Tim: .. and Michael Stirling Aird also asked which photographers inspire you, which books do you buy etc? Tim: Joao Maia: After looking at your stunning images of Iceland from the air, I wanted to ask you what were the main challenges that you found, shooting from an aeroplane and how do you adapt your composition approach? Hans: The challenges are first I have a physical challenge, I tend to get airsick quite easily so I absolutely need to have some medical treatment so I use a plaster behind the ear called scopoderm which contains scopolamine which is kind of drug which prevents me from getting airsick and then from a shooting point of view, you have to think the opposite way from ground level photography, actually the best conditions is clear blue skies, I mean no clouds, you need as much light as possible. This to improve the performance of the camera because you can't shoot at low shutter speed and you don’t want to shoot wide open either because the lenses tend to be softer, so its, I have to, I use 200 ISO and I put my camera on shutter priority at 1/800th of a second. Tim: Is this the Hasselblad? Hans: The Hasselblad and then I generally get f/4 and f/5.6 on the aperture and I would say 98% of my shooting is with standard 80mm lenses because it's a very, very good lens, it performs very well even quite good at f/2.8 but at f/44 its razor sharp and then I zoom with the altitude of the aeroplane. I tell the pilot to fly lower or higher, and then of course it’s, you have to be very quick with your compositions, it’s like shooting clay pigeons and you have to very accurate with your instructions to the pilot and that takes a while, especially if you have a new pilot and I tend to have different pilots every time I fly so it takes a while, to start with it can seem to be a completely impossible if you have a pilot who doesn’t understand what you’re up to. Tim: And you normally shoot from aircraft instead of helicopters? Hans: Yes, I can’t afford flying helicopters, it costs about 6 to 8 times more, you know, it’s like shooting from a tripod, shooting from a helicopter, it’s a piece of cake compared to, but on the other hand I think when I shoot from an aeroplane, you see more things that you, that you, and you get more opportunities than shooting from a helicopter because you’re all over the place when you fly with an aeroplane you make your 360s and whether you want or not you end up doing a 360 and you might see your object from an angle you hadn’t thought of from the beginning, whereas with a helicopter you fly from A to B to C to D etc. Tim: Do you shoot wide then, presuming you’re going to crop a little bit? Tim: He asked me what your favourite wine is? Tim: Excellent (I think). I’ve got a quick couple of questions, the first one is, your working practice when you're in the field when finding pictures, you mentioned that you tend to plan bigger than the grand views, do you go back to places regularly or do you like to go to new places every time and when you’re out working in the field, how do you find the picture, do you use the camera all the time or do you work with a composing frame or just wander, looking with your eye? Hans: Actually I don’t see myself as an absolute nature photographer, I see myself as a photographer in general, so I get a kick out of places like this, the complexity and specially here, you know, where things are rusting and decaying in this harsh arctic environment, I think it’s just fantastic to see all the machinery rusting you know and getting, you know gradually it becomes in one with nature, you know, it erodes like any natural object like rocks and the ozone, they don’t live a lot forever, they erode into sand and here you see the process. Tim: And were you either on a commission, or I mean presumably, had you not gone on a documentary? Tim: Yes, what do you think of Svalbard? Tim: Yes, that’s one of next questions which was this, about a couple of pictures, because somebody asked about an aerial photograph on Facebook. Here's the image and the one below is a wider view of a similar location. Tim: And presumably the white areas either side are snow? Tim: Yes, large rivers then. Tim: Is this, is that in the centre of Iceland then? Tim: Yeah, and in terms of, would you try and shoot photographs like that with the Hasselblad? Tim: The next picture is one I particularly like, which is late autumn mist in Trekanten, Hägersten. Tim: So would you, do you go out regularly in your local area with your camera just to ... ? Tim: ... and talking about the sort of painting effect, this is a, I’ve just sent you a link to a rowan tree in Hibo, Hälsingland. Tim: Is this, would this be a just a scouting trip for you or were you on a job or .... ? Tim: Do you have much problems in the cold, I mean I know you’ve been out in -20C, -30C, does it cause any problems with the cameras? Tim: And do you keep your equipment in the car or anything, to keep it ...? Hans: No I haven't, not really. Tim: Did the whole thing fall? Tim: So were you on your own on these trips? Tim: Ha-ha, so when you go, do you hire somebody to take you to interesting locations or? When you have a guide? Tim: Who knew the location? Tim: And do they get earthquakes in Iceland? Hans: If there's a big one, most of them are very small about like one on the Richter scale, but if you’re in an ice cave and you get a big one like a 5 or 6 it can get up to 6.2 and then it can be absolutely lethal you know? Tim: Moving on to a picture from France I believe, is that correct? Tim: So you’re quite keen on your wine? Tim: Have you done work, photography work for vineyards? Tim: Do you have any of this work in websites or? Tim: Did you get any problems with film in those temperatures as well? Tim: Ok, you shoot in Abisko quite regularly as well, if you were recommending somebody to visit the north for Autumn, is that the sort of place you would recommend? Tim: Do you have some Abisko pictures on your gallery which ones, where would they be? Tim: I should ask you about your adventures at a certain volcano which I’ll try and pronounce – Eyjafjallajökull - How did that come about, that must have been quite a snap decision or were you already out there? Hans: Yeah sure, and you see the lava bombs coming out, and it was on one of the pictures I was blowing it up in 100% and you can see that these stones they are really red, not in this picture you can’t see but I had some other pictures where you can see where you blow the picture up that there were red stones and I think some of stones were big as cars you know Tim: Yes. And did you, I mean did you use these, or submit them to libraries, etc? Tim: Perhaps we could do an article on it some time? Tim: Now when you’re shooting with black and white, do you think about black and white when you’re out shooting? Tim: Because if you presumably you shot black and white film when you..
Hans: Only option is to sell it as art and it’s a very limited, very limited possibilities for that here in Sweden Tim: Just posting another one which is a reflection from Landmannalaugar. In particular, on this shot, how much processing you do with your black and white shots, do you work them quite hard or are they fairly straight out of the cmaera? Tim: Your opinion on SilverFX? Tim: So you would use SilverFX over Photoshop? Tim: So these are very small then? Tim: How do you blend those when you’ve got your ... ? Tim: It’s not layers is it, it’s very comprehensive? Tim: So does Helicon work immediately, I mean you put the photographs in or do you have to do manual work afterwards? Tim: And was this on the Hasselblad again? Tim: How do you print your pictures? Tim: So you're sending your prints off at the moment? Hans: Yeah I do all my printing at a professional lab, they are using LightJet, both for colour and black and white. Have you made any comparison between an inkjet and a LightJet in terms of tonal range? Tim: But you say that you’re getting the black and white done on baryta paper as well? Tim: So how do you, so presumably that’s all the water spray coming up, how do you keep the camera dry, and especially the lens dry? Tim: Your standing on a ledge, are you? Tim: The scale is quite difficult to tell then isn’t it ... ? Tim: And you’ve had prints of this made in the baryta? Tim: .... do you prefer black and white or colour, you feel more natural when you are shooting one or the other? Tim: Yeah I do have quite a lot of E100G, the later version of it, and it is a very lovely, neutral film. Tim: Well thank you for that, is there any final message you would like to pass on... covered? Hans: I’m happy for that. I just saw a fantastic picture of a frosty cow on your website from what’s her name, from Samantha? Tim: ...and whereabouts do you see your photography going in the next few years or decade or whatever, have you got an idea? Tim: Have you got any more after that? Tim: Well thank you very much Hans - we'll link to your website with the workshops at the end of the article.